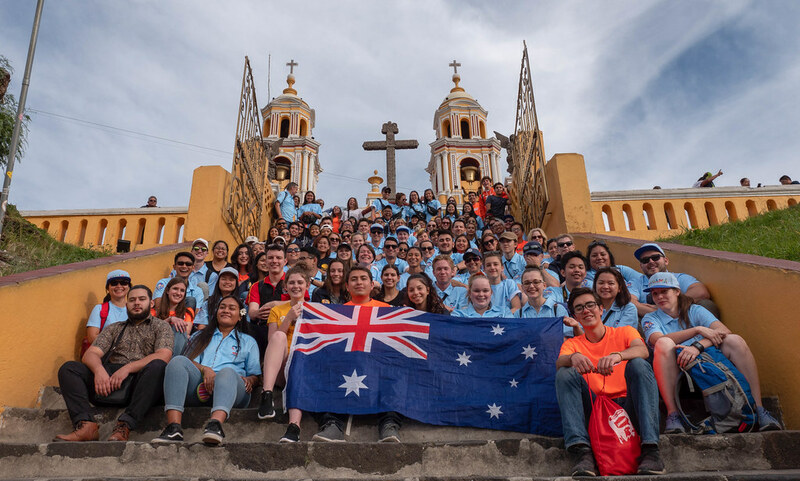 Diocese of Parramatta pilgrims participate in mission work in Puebla, Mexico. Image: Diocese of Parramatta. Today was a chance for pilgrims from the Diocese of Parramatta to experience the works of the church around Puebla with experiences in schools, rehabilitation centres and orphanages. The day began with a visit to the Church of Santo Domingo (Saint Dominic) with morning prayer. During his talk in the chapel inside the Santo Domingo, pilgrimage chaplain Fr Andrew Fornal OP (St Joseph’s Parish Kingswood), implored the pilgrims to be generous in offering their time for God. He encouraged pilgrims to spend time in prayer and service of God. He stressed the importance of spending quality time with each other in fellowship and using the chapel encouraged pilgrims to pray the rosary. Following morning prayer, the pilgrims spent the day visiting various sites across Puebla including schools, ministry with the elderly and abandoned, orphanages and medical rehabilitation. This was time for the pilgrims to experience different types of service as part of the pilgrimage. Diocese of Parramatta pilgrims during morning prayer at the Church of Santo Domingo (Saint Dominic) in Puebla, Mexico. Image: Diocese of Parramatta. Scott Carroll, teaching educator at the Catholic Education Diocese of Parramatta Mission Team spent time with a group at Hermanas De Le Caridad de Puebla at a ministry site that is run by the Sisters of Charity for the elderly and abandoned. “We came expecting to serve food and minister to the community here, but we have been nourished by the experience. There was a real connection with the people there despite the language barrier” he said. Catholic Education Diocese of Parramatta Executive Director Greg Whitby, Bishop Vincent Long OFM Conv, a member of CRIT Puebla and Fr Fernando Montano are seen outside CRIT Puebla in Puebla, Mexico. Image: Diocese of Parramatta. Melissa Fardella, a pilgrim group leader attended CRIT Puebla an organisation that supports one million children per year with muscular and neurological disabilities. “The facility completely exceeded my expectations. Their world-class facilities catered not just for children with neurological and muscular disabilities but supported the whole family with a holistic view. In the evening pilgrims will be attending the Seminary Palafoxiano for Mass celebrated by the Archbishop of Puebla José Víctor Manuel Valentín Sánchez Espinosa and experience an evening of Mexican culture and food.